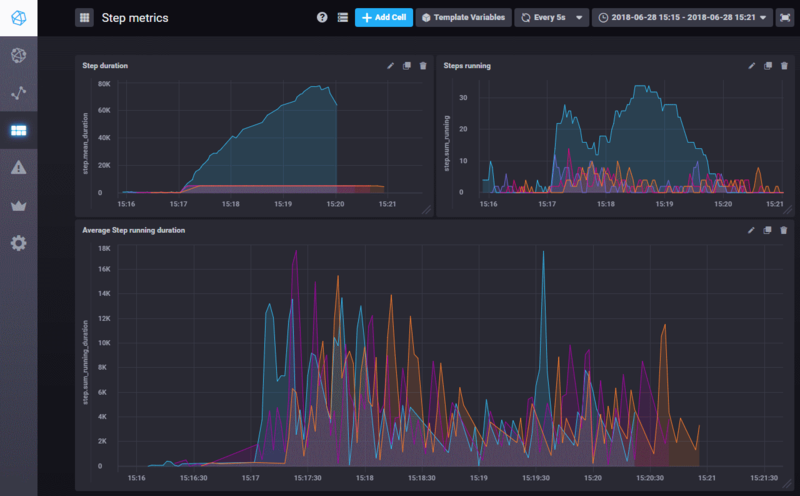 Chronograf is a web-based GUI for visualizing time-series data, typically from a time-series database such as InfluxDB. I have been using it recently to store load-test measurements created by the MuseIDE Measurements extension. I have been running it in the cloud, starting up a fresh instance whenever I have the need for storing load test results. This is handy and very cost-effective, but starting from scratch means that I need to set up dashboards of the metrics I want to see every time. Looking for a solution, I found a post on the InfluxData blog that describes an API that can be used to backup and restore dashboards. But using curl from the command line is a bit inefficient. So I pulled together some code to do it from a friendlier CLI that allows backing up and restoring just one specific dashboard or all of them at once. Adding a -id 3 parameter allows me to backup one specific dashboard, using the dashboards id (which is the last part of the dashboards URL). That dashboard file can then be restored independently. Pre-built distribution, full instructions and the source code is on GitHub – pass it along! Download the distribution from the releases tab.